This is the time of year when we dream of those hot summer days around the pool, lounging in a chair and basking in the sunlight. It’s also a good time of year to make plans for increasing your enjoyment of the pool area when the warm weather arrives. One way to get more benefits from your pool is to install a pool area screen. There are many things to consider when choosing a pool screen, such as panels, frames, color, and overall style and construction. However, the screen itself might be the most important element to choose. There are different types of screens to select from, depending upon the type of enclosure you want, and your overall budget. While many standard screens are made of fiberglass, there are other varieties made of different materials with specialized qualities. Pool screens help keep the pool area and water free from all kinds of insects, from bees and wasps to mosquitoes that might carry the Zika and West Nile viruses. And no one wants to find bugs in their food and drink, or be stung or feasted upon while swimming or lounging around the pool. Pool screens also prevent intrusions from lizards, snakes, mice raccoons, cats and dogs. To keep out the smallest insects — those little “no-see-ums” with their painful bites — you’ll need to install screening with a mesh that’s tight enough to stop them. Although not a substitute for sunscreen, pool enclosures with solar screens can block out from thirty to ninety per cent of the sun’s harmful ultraviolet rays. Solar screens are made from a special type of mesh that controls the sun’s heat and glare, and there are a variety of types to choose from that vary in their degree of UV protection. They can also keep your patio area up to fifteen degrees cooler, which means you can stay comfortable outside longer. You’ll still need to use a sunscreen, but with a solar screen you don’t have to reapply the lotion on your kids every thirty minutes or so (and then keep them out of the pool until the application dries). The sun not only damages skin, but it can also damage pool and patio furniture (e.g. wood, plastic and wicker), and cause fabrics to fade. 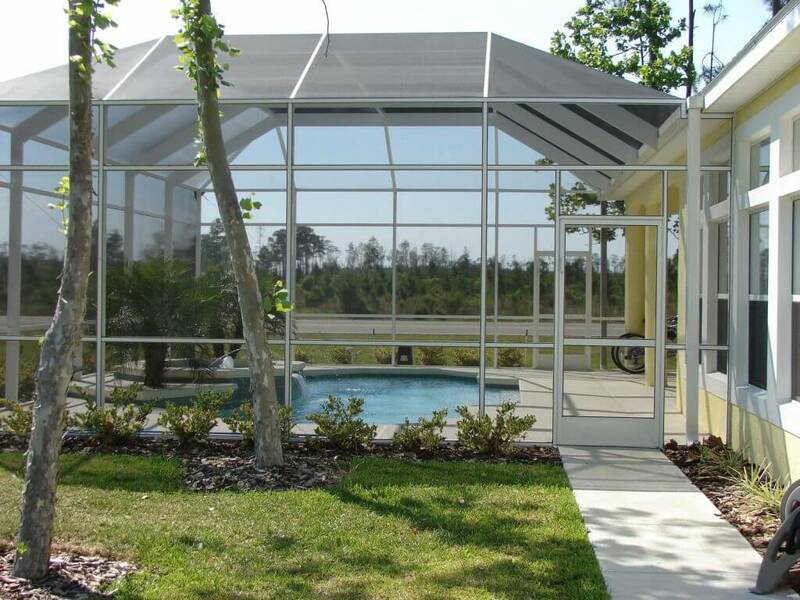 Installing solar screens in your pool enclosure can extend the life and appearance of your outdoor furniture. There is a type of privacy screen that will prevent anyone from seeing inside (you also can’t see outside). It’s made out of vinyl-laminated fiberglass and has the appearance of obscured glass. If your neighbors live very close, this may be the type of screen you’d prefer for certain areas of your enclosure. Because it doesn’t permit air to flow through, you may want to consider using this type of privacy screen in combination with other types of screens. Pool enclosures can prevent neighborhood children from using your pool unsupervised, uninvited guests dropping in for a swim, and strangers and vagrants using your pool when you’re not home. Creating another living space next to the pool can make your home feel more spacious. You can add outdoor kitchen, dining, and relaxation areas for family enjoyment and entertaining friends. And with an insect-free enclosure attached to the house, you can leave the patio doors open for easy access to the pool. A pool enclosure makes it easier to watch small children, and prevents them from wandering off. And if children of all ages get a little rambunctious around the screen, there’s a type of mesh that withstands rough and tumble play without tearing. This same rugged mesh keep your pets safely corralled, and can withstand pawing and clawing if your pets try to break out. Yard debris can fall or blow into your pool, along with pine needles, dirt, flowers, grass clippings, and leaves. As a result, both you and your pool filters have to do more work. Some people install privacy screens (vinyl-laminated fiberglass mesh) along the lower enclosure panels because of its superior ability to keep water, dirt, and debris from coming in the bottom of the screen. When choosing an enclosure design, you can pick one that allows the debris to slide off the roof. If you choose a flat-topped model, a leaf-blower will allow you to clean the roof quickly and easily. A pool enclosure makes your pool maintenance much easier — you’re not fishing debris out of the pool on a regular basis, and your filters don’t have to work as hard and will last longer. As well, if you use solar screens that block out UV rays, you won’t have to use as much chlorine and other chemicals in the pool. UV rays cause chlorine and other chemicals to evaporate. A pool enclosure with solar screens can help these chemicals last longer, and your pool won’t need treatment as often. And because the water is cleaner in general, you can cut down on the number of chemicals, saving you money. Not only do the chemicals evaporate, but the pool water does as well, especially during the hottest months. Water restrictions may make it difficult to fill the pool back up. Fortunately, a pool enclosure can slow down the evaporation process by keeping the temperature cooler in the area. Pool enclosures can really enhance the overall visual appeal of your home. Many of the structures can be painted any color to match the exterior of your home, or to make it blend in with a surrounding garden. The screens themselves come in different colors, and you can get creative with your designs and customize the materials. Building a pool enclosure not only provides enjoyment for the family, but it’s an investment. It’s one of the most popular additions to a home with a pool. When it comes time to sell, it will have added value to your home. Let the professionals at Sunshine Sunrooms help you design and build a pool screen that’s both practical and beautiful. Call us today at (972) 243-5390.